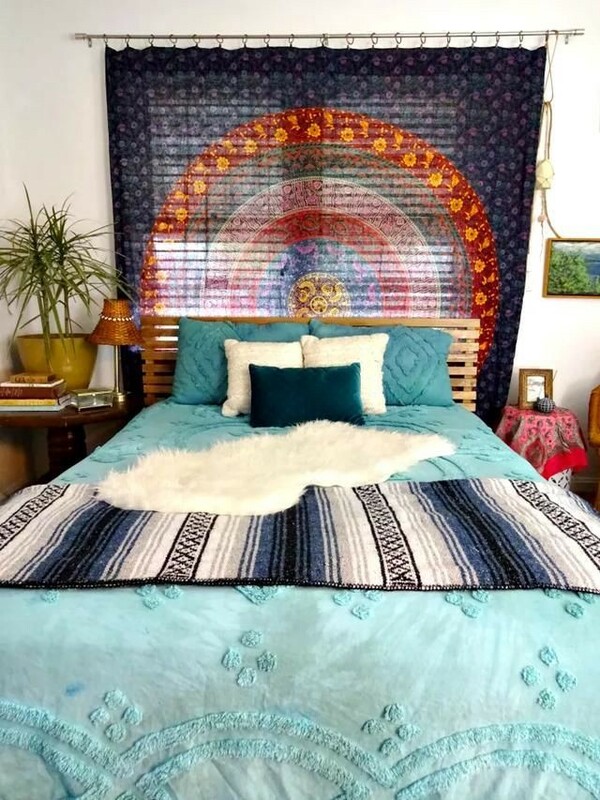 If your bedroom is feeling a bit tired, wake it up to new style with quick and easy DIY project that require more imagination than cash. Get a fresh look with bargain market finds, or unleash your inner carpenter with projects that even a novice can handle. Whether your choice is to change the room or change what’s in it, the best part is the satisfaction of knowing that you did it yourself. Many of our favorite projects take less than a day to complete. If you don’t currently have a headboard, or if your headboard has seen better days, there’s an easy fix. A standard-size door (36 x 84) is perfect for a king-size bed and can turn a twin mattress into a daybed. Choose a new hollow-core door from your local home store, or look for a weathered door with rustic appeal. Use appropriate metal L-brackets to hold the door securely to the wall at top and bottom. Finish it off with a narrow strip of molding at the top, or attach shelves on either side for a custom treatment. One hookless fabric shower curtain, a length of wooden closet rod from the big box store, and two or three wooden brackets are the only supplies you’ll need. Paint or stain the rod, thread the grommets of the curtain onto it, and place it on the brackets. It couldn’t be easier, won’t cost more than $30 to $50, and will look great. Shed light where it belongs by installing two stylish wall-mounted swing-arm lamps on either side of the bed, eliminating the need to use limited nightstand space for lamps. The wall-mounts look great and put the light at just the right height for reading in bed. Prices vary, but we recommend to check out Ikea for contemporary lamps or online catalogues for moderately-priced lighting in a variety of styles. It’s hard to get more bang for your buck. Paint refreshes a room quickly, can be easily changed when you tire of the color, and almost anyone can paint a wall! Paint is also a great bargain, but take the time to prep your walls before beginning a project. And be sure to protect your furniture and flooring. If you’re living with wood or tile floors, choose something soft to add color and comfort to your bedroom. Shop for a roll end or remnant at a carpet store; allow about two feet of bare floor around the perimeter of the room. It doesn’t cost a lot to have the edges bound, plus you can roll up the rug during warm summer months. As an alternative, pick up one large area rug or two smaller ones for each side of the bed. Look for an old bench to place at the foot of the bed. If you find one with a wicker seat or dated upholstery, so much the better. Even a piano bench has possibilities. Update the look with paint or new fabric, and treat yourself to a special dinner with the money you save. The good news is that you won’t have to spend more than $100. Shop discount stores or be on the lookout for brand name seasonal closeouts. Consignment stores and resale shops also are worth a look; Have used bedding cleaned and you’ll have an entirely new bedroom. Fans are practical, and chandeliers are trendy. One of the best ways to modernize a bedroom is by looking up at the “fifth wall” and hanging a vintage fixture or a new fan. There are styles for less than $100 to match any decor. If you’re uncomfortable tackling electrical work yourself, enlist a handyman service that charges an hourly rate. It’s easy to create a gallery wall: Refinish old, empty frames to showcase oddly-shaped mementos, trophies, awards or smaller framed photos. Or attach strips of shelving and trim to hold propped up family photos, children’s artwork, and small books. Attach hand-painted cabinet pulls to a length of 1 x 3, or select unusual hooks from a hardware store or craft shop. World Market is a great place to look for artistic knobs and hooks. Corral belts, jewelry, baseball caps, or scarves so they’ll always be handy. The graphic statement will be a powerful one!